The Kitchen Garden Foundation has a strong history of collaborating with councils and shires, and can help deliver a range of health, education and community benefits. Kitchen garden programs are an opportunity to implement and embed your community’s Health and Wellbeing Plan by supporting positive health outcomes for children. A joint 2007–2009 Deakin University and University of Melbourne evaluation shows that the Stephanie Alexander Kitchen Garden Program encourages positive health behaviour change in participating children. View the complete state evaluation report here. Kitchen garden students are highly engaged learners because kitchen and garden classes are fun! Research shows that students who are relaxed and happy are more likely to engage, absorb information and make the most of the learning opportunities around them. Kitchens and gardens are powerful learning spaces where children learn through practical, real-life experience. Kitchen garden students dig deeper into their curriculum and learn traditional subjects such as mathematics and science in a whole new way in the kitchen and garden. This style of food education is widely supported by government Education and Health Departments in Australia, as well as by World Health Organization (WHO) recommendations. A kitchen garden program is a catalyst for building social cohesion and community resilience. It’s where educators, students, families, members of the community and businesses come together to share food, learning and fun. School grounds can be utilised for community events involving cooking and sharing. Read this news story about how Jarrahdale Primary School transformed the school’s undercover area into the Harvest Bounty Restaurant and treated 60 members of the community to a delicious three-course meal. Participation through community volunteering is an important element of healthy and secure communities, and community volunteers are highly valued in a kitchen garden program. Watch volunteers discuss how rewarding volunteering in a kitchen garden program can be. There are countless ways to reduce, reuse and recycle through a kitchen garden program. As well as environmental sustainability, kitchen garden programs also teach communities about financial sustainability through budgeting and fundraising. Gardens give children and communities a chance to spend time outdoors. They are the ideal setting to learn about the natural environment, the seasons and how to care for gardens. Research shows that garden classes build confidence, encourage teamwork, help develop creative-thinking skills and motivate students to embrace a healthy, active and sustainable lifestyle. Read Gardening in schools: A vital tool for children’s learning to hear how school gardening teaches students to become more resilient, responsible and ready to learn. Kitchen garden programs provide students with a hands-on understanding of food systems, and their importance. They give students and the broader community the skills and knowledge to act and contribute to food security in the community. Customised professional development for your council staff. Networking and building capacity to promote health and sustainability in schools and early years centres in your region. Opportunities to bring your community together with pleasurable food education. Read how one council is helping grow kitchen garden programs in this news story. 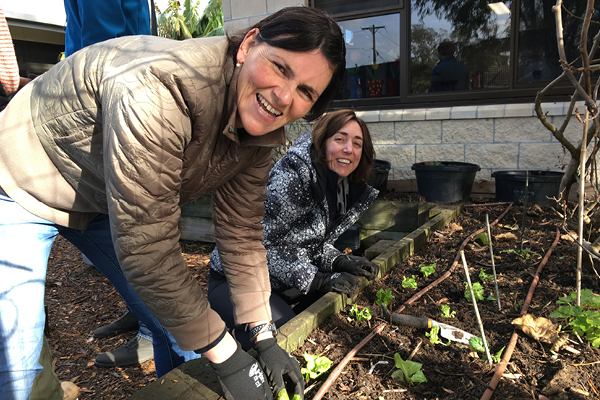 Watch this video to find out how Brimbank City Council has worked with the Kitchen Garden Foundation to help nine schools in its area start a kichen garden program. Download the Become a kitchen garden council flyer.